Meet MMHS Board Member Sandy Arpen and learn why she loves Mandarin. 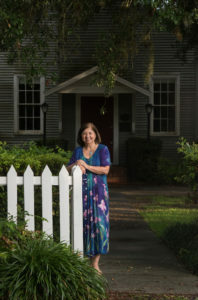 Sandy moved to Mandarin in 1961, eventually married a Mandarin native, and adopted the community as her permanent “hometown.” She is currently serving as the President of the Board. “I chose to have my photo taken at the historic Mandarin Community Club building because it is a place that is special to me for many reasons. For one thing it is the most historic building in Mandarin, having been built in 1872 as a schoolhouse through the involvement of Mandarin’s most famous resident and my heroine, Harriet Beecher Stowe. Every time I enter the building and look at the gorgeous portrait of Harriet overlooking the hall, I feel her presence there. I imagine it being used as a schoolhouse during the week and a place of worship on Sunday, with the Stowe’s actually dragging a little organ across the dirt street from their home so they could have music at the services. This property has always been the heart of Mandarin. This is where the Post Office was built in 1911, where the ‘villagers’ worked together for the Liberty League during World War I and where the Mandarin Community Club was founded in 1923. Many don’t know that this is also where plays took place with community members building the sets and acting out plays for over a century. I was a transplant to Mandarin in 1961, but my husband Tracey is a native and his father, mother and sister all acted and volunteered with the Mandarin Players – and they have great memories of those times. More recent memories of fondness for me here are the days when Tracey served as President of the MCC Board and the many years when our whole family would work the Art Festival. Tracey and I flipped burgers and our kids took orders from the artists and served them their food so they wouldn’t have to leave their booths. What a great training ground that was for our children – to learn first hand of the importance of public service. Lastly, this place was also where Mandarin Museum & Historical Society was birthed. When the public started bringing art and objects that represented Mandarin’s history to the club, a small group of MCC members decided to form a brand new historical society to manage and display the historical heritage of the community. We still share a partnership today, as MMHS leases the Store and Post Office to us so we can display a mid 20th-century country store and we hold our Third Thursday Lectures in the Community Club because we have no space for such events at Walter Jones Park. We greatly appreciate that partnership.